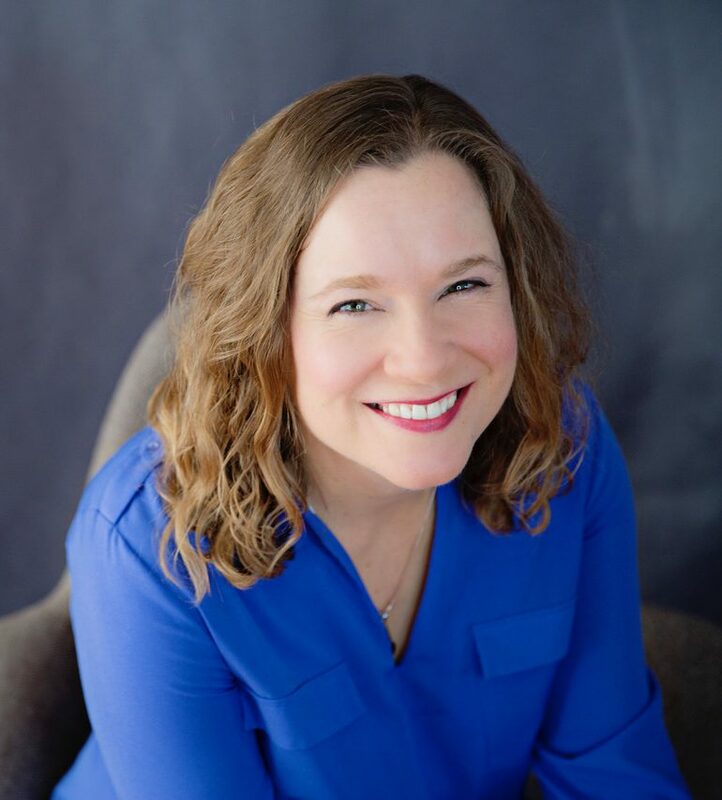 Sweet Spot Nutrition > Miscellaneous > Behind the scenes of my meal planning system, part 1: Recipes! 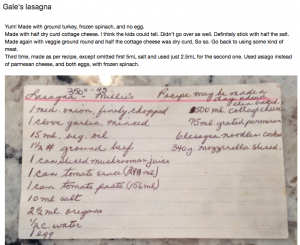 A few years ago, I moved my recipe collection to a digital format, and I love it! It’s definitely not for everyone though. If you too like to hoard recipes, and want to find the right one quickly, from anywhere, consider it. But balance that against the time it will take to set it up and your comfort level with having your tablet, computer, or phone within splashing distance of the stove. If that sounds like you, join me for a peek. If not, join me next week, when I’ll share my must-have go-to meal and snack list. So where are your recipes? Recipes are everywhere. 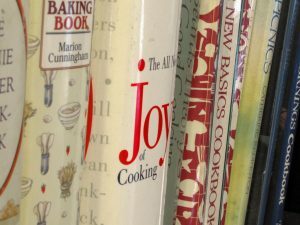 You probably have a shelf full of cookbooks, perhaps some pages torn from magazines, and who knows how many bookmarked from that recipe treasure trove in the cloud. One of the first recipes in my collection. 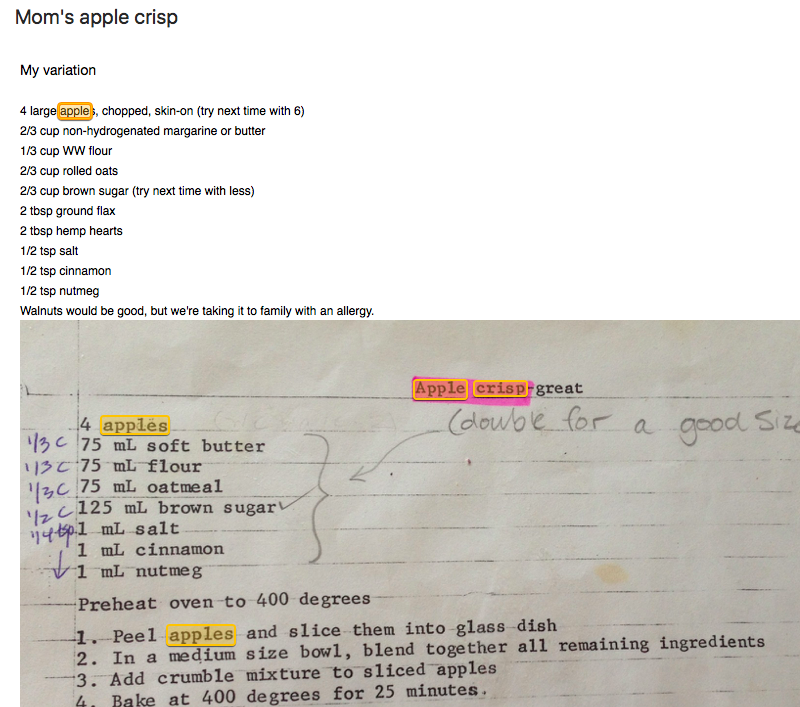 Searched for “apple crisp,” so those words are highlighted. 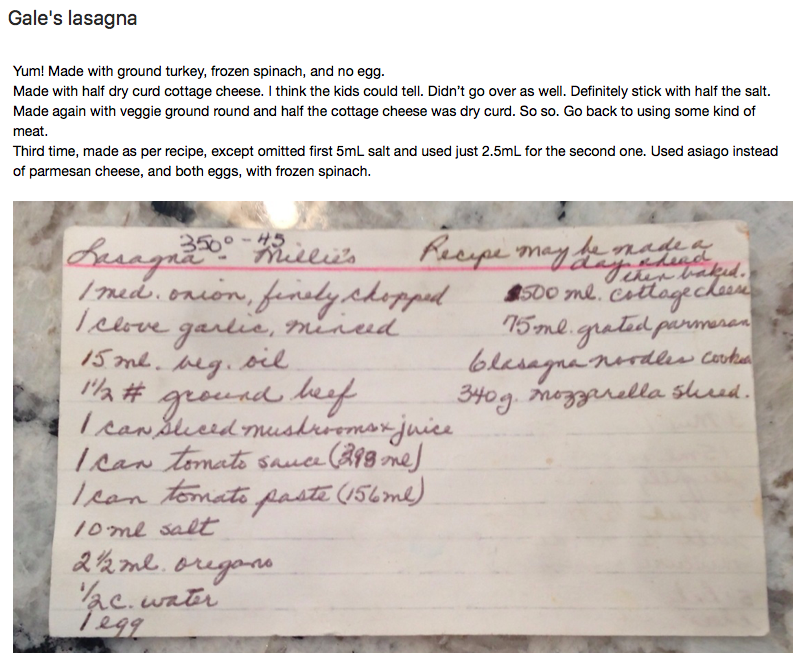 I started my recipe collection over 30 years ago, in high school! (Dating myself.) I’d type up or photocopy recipes I liked, even if the cookbook lived in our kitchen, so they could be in my collection. Soon I had two, then three overstuffed binders. Every few years, when they became unwieldy, I would buy shiny new dividers and reorganize, but it was always kind of chaotic. Finally I decided to go digital. I spent months researching recipe apps, but in the end, I decided to use a note-taking tool called Evernote (no affiliation). 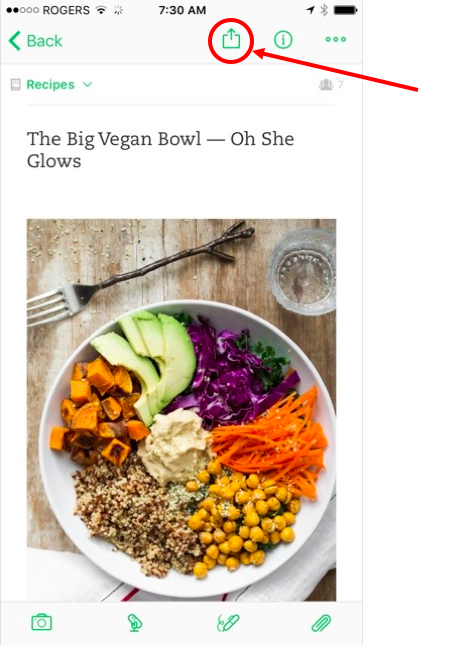 The awesome thing about my Evernote recipe collection is that I can search every word of text in (almost) every recipe I’ve collected, from any source: Recipe cards from my sister-in-law, pictures snapped from cookbooks, and recipes clipped from the Internet, of course. As digital as we are, a lot of recipes are still floating around on paper. Wouldn’t it be nice if you could search your personal collection like you search the web? That way, if you have a half a head of cabbage in the crisper, you can easily figure out what to do with it. Farm share delivers kohlrabi? Click, click, there’s that kohlrabi recipe a friend recommended. Blessed with 11 zucchinis all at once? You get the picture. If you’re considering going digital, whichever tool you use, make sure it has a feature called “Optical Character Recognition” (OCR). That’s just a fancy way of saying it can search through text in photos and scanned images. Any recipe app can search through recipes you save from the Internet or type in. (Seriously? who’s got time for that?) But with this feature, you take a picture or scan and voila, searchable. It took a couple of afternoons, but before long, I had scanned in my recipes and recycled all that paper. (Fun fact, I think this is the oldest one in there, and you can see that Evernote even managed to search through my youthful handwriting (hunting for “butter”). There is a limit though: OCR struggles with cursive, so it won’t find any of the ingredients of the one below. Solution: Give each note/recipe a title, so it will find that at least. This benefit is a bit geeky, but powerful: organizing with tags. Think about a big paper-based recipe collection — what’s the best way to organize it? By course — salads, soups, desserts, etc? By ingredients — fish, beans, chicken? By attributes? “Ready in less than 20 minutes” or new vs. tried and true? With a physical system you can only sort things in one way. If you like, you can select items with multiple tags: Vacation plus Takes <20 minutes, for example, if you want to cook at the lake, but not all day. Or Fish plus Prepare ahead, if you’ll be getting home right before dinnertime. Magic. The other big benefit of a digital recipe collection is that you can access your favourite recipes from anywhere: Your tablet on vacation, your computer at work, your phone in the grocery store. Two ways you can share using Evernote recipes. First, if a friend asks you for a recipe, simply open up Evernote on your phone and email or text it to them. 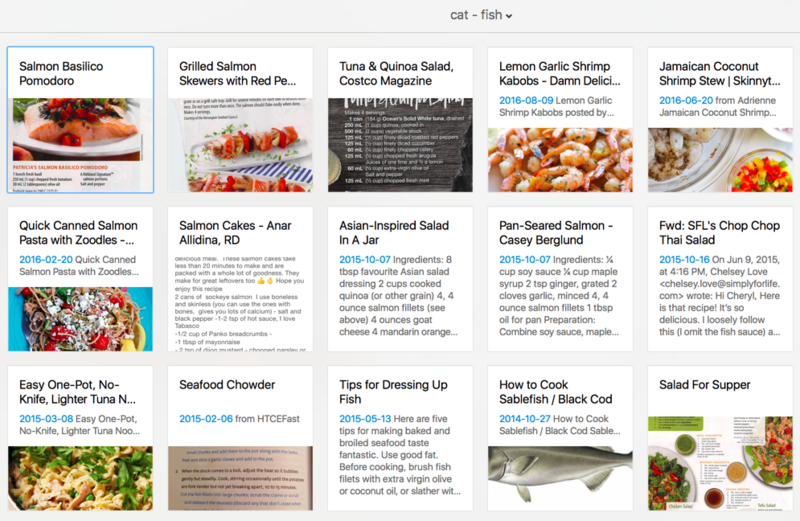 Also, you can make your entire recipe collection accessible to another Evernote user, say your spouse or teenager. The biggest downside to this is that setting it up will take some time, depending on how big your recipe collection is. The benefits don’t come to fruition until you have a critical mass of recipes in there, so try to set aside an afternoon to jumpstart it. The other downside is that you may not like doing your cooking from a tablet or phone. It might turn off just when you get raw egg on your hands. You might spill. I use my laptop, perched above the action on the bar. And I do have one binder left in service, containing our frequently used recipes. That way I can leave one out for my husband or the kids to do. Can you use the free version of Evernote? You can, but I wouldn’t advise it. The free version only lets you share documents between two devices and only upload 60MB a month. (A scanned, full-colour, full-sized page is about 2MB, although most of mine are smaller than that.) When you’re setting things up, you’ll hit that 60MB limit pretty quickly. The Evernote extension, called Web Clipper, installed on your browser. Set up a notebook called Recipes. Decide what tags you want to use (see ideas above). Less is more! Keep it simple. 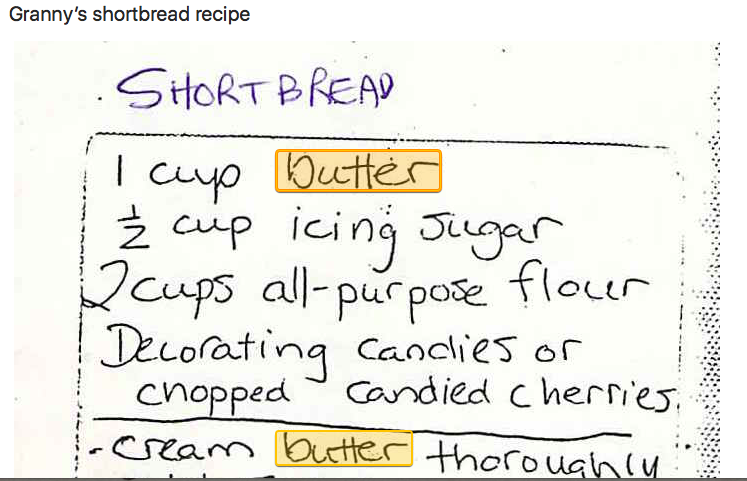 Remember, Evernote can search the words in the recipe, so only use tags when that won’t cut it. You can always go back and add a tag if you decide later you need it. Start scanning! I prefer to save the files as JPG’s. Give every recipe a decent title, because that comes up first when searching. 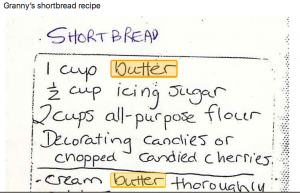 If you’ve printed a recipe from the Internet, check to see if it’s still online. If so, save it from there (using the Web Clipper) instead of scanning it. 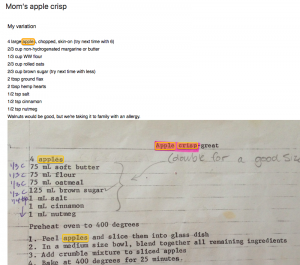 When clipping recipes from the Internet, try to get just the recipe itself and one image. Whether you want all of the extra images and chatty text is up to you, but they will make your file sizes larger. Definitely don’t clip other content on the web page, like comments or links to other recipes, because they will mess up your searches. 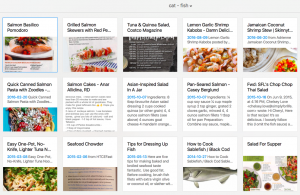 Many online recipes have a “Print” function, which can help with capturing just the recipe. Alternately, try options on the Evernote Clipper like “simplified article” or “selection”. Now whenever you come across a recipe you want to keep, add it to your collection, and soon you’ll have nearly 700, like me. (Including 39 fish dishes, 99 with legumes, and 109 containing the word chocolate. Priorities.) Impress your friends. One last idea, if you want to take advantage of your personal cookbook collection, is to scan the indexes from your cookbooks. That way they’ll pop up while you’re searching and harness the arsenal of great recipes you have hiding within. Well, now you know my little hobby (/obsession). You don’t need to get this carried away, but it makes meal planning fun. At the very least, aim to have a repertoire of 10-15 simple meals you can confidently make, whether they’re in a binder, cookbooks, or your head. That will be the focus of part two, next week, my go-to meal and snack list. Meanwhile, I’d love to hear from you. How do you organize your recipes? Do you have another digital solution? Share on the Sweet Spot Facebook page. *** As always, this is not a sponsored post. I have no affiliation to Evernote. ← PURE Study: Should you be eating more fat?